If you provide financial planner, the social media world is filled with Do’s and Don’ts for people that give financial advice. Good news, my friend! Here is your Local SEO road map. Online marketing is a never ending rabbit hole of all the people you could turn into a customer. Because we don’t have a bottomless bucket of marketing funds or endless hours of time. Drop The Strap offers Internet Marketing Services that concentrate on three types of people searching for your business. Let’s start with the absolute most important. If an existing customer is looking for you, make damn sure they find a phone number or way to contact you. They are your current revenue stream and provide your most valuable word of mouth advertising. (2) Someone that has heard of you. You might call this person a warm lead. They have heard of you via a friend or know an employee. Some how they know your name and are looking for you. (3) Someone looking for the service you offer. This person doesn’t know you, but is actively looking for the product or service you offer. In all three of the above cases Local SEO is mission critical. Need help? Would you like us to take care of this for you? Book a discovery call and ask for the Financial Planner Foundation Package. More of a DIY kinds person? Keep reading. You must make sure Google knows the name of your business, the phone number, the address and your website if you have one. In addition to the Name, Address, Phone(NAP), and Website(NAPW) search engines need to know what it is you offer. We use keywords to describe your business. Some keywords are universal and others are based off location. Search terms are just like language. It differs by region and even city to city. Keyword Research is how we determine what words to use to describe your business. If you have a location for customers to visit, you need to define your hours of operation. Search engines know display if you are open or closed at the time you pop up in search results. There is one more unavoidable piece to marketing your business online. You need images. The more you can display the better. Because we are talking about the minimum effective dose, here is the list of must have images. A high quality logo file. A square logo for profile photos. A street view of your physical location. Some photos of you doing what it is you claim to do. Some photos of your team. Some photos that humanize you. Some photos that link you to the local community. Use the list above to come up with 10 image files. Before you start listing off all the reasons you can’t display an images, this is your opportunity to get a jump on the competition. A few big reasons to display images. Your competition is as reluctant as you. Google likes images, Google Image search is beyond popular. People don’t read anymore, show them what you want them to know. Now that you have gathered all the needed information and assets, It’s time to get started. Optimize every account. This means when describing your business use the keywords you discovered in your keyword research. Give you images SEO friendly names. Fill out EVERY field in all your profiles. Verify your accounts. Go to your trusted customers and ask for them to give a 5 star review. GMB is where you start. Get 5 reviews and then move on to Facebook. Identify all the customer touch points where an ask for a review can be added. Email signatures, website footers, invoices and other digital communications are goods places to start. Now that you have created a solid foundation of online listings, have an internet marketer take a look at your profiles. Do you have any Call-To-Action prompts? Are your images sized correctly? Is your NAPW accurate on the major citation sites? Drop The Strap offers an Audit of your business. We delivery you an over the shoulder audit where we look for you online. Do you show up when searched for by name? Do you show up where searched for by the product or service you offer? A look at where you are is the first step to any online marketing plan. We also offer ongoing coaching. Once your foundation is in place, a once a month coaching call or once a quarter coaching call is a great way to stay on top of ever changing search result trends. 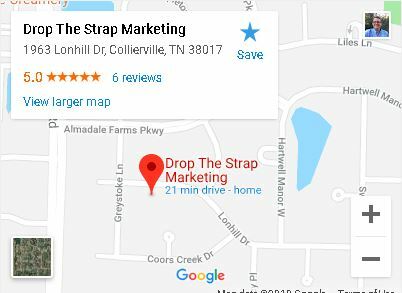 Book a discovery call today with Drop The Strap. It is the best way to find out if we are a good fit. We look forward to helping you rank in the search results. Did you find this beneficial? Are you better informed? We would really appreciate a review, it only takes a moment.